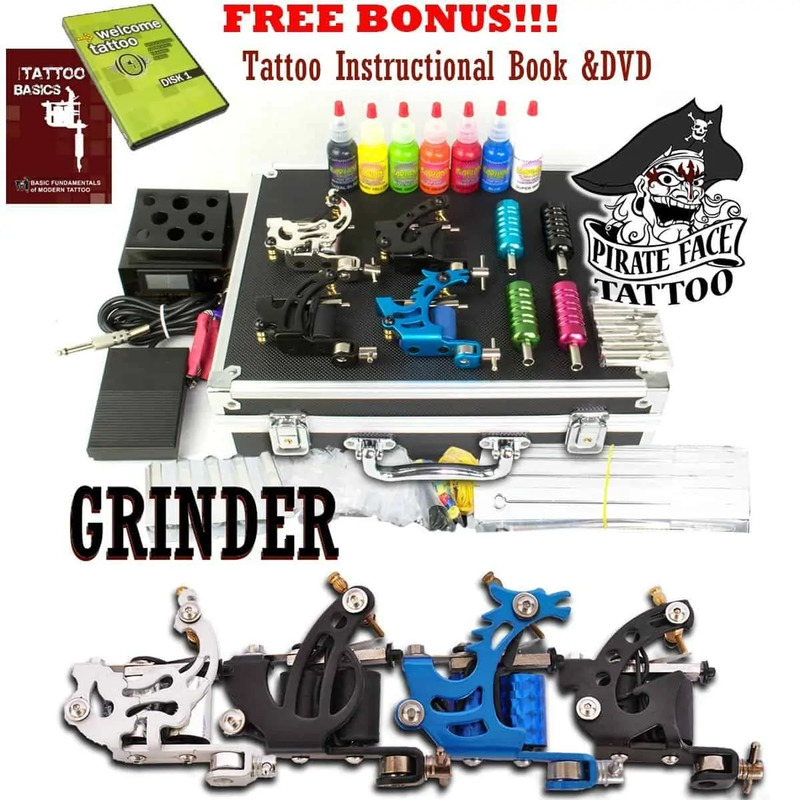 I want to review here one of the most successful and recommended tattoo kits for beginners this days – the Grinder tattoo kit, by Pirate Face Tattoos. To summarize the review with one fast “one-liner” without wasting your time, the Grinder tattoo kit quality and the variety of accessories that come with is impressive and the value for money is great. It’s highly recommended tattoo set for beginners, apprentices and professionals alike. Lets now explore the reasons for those recommendations while examining the details of the kit. With this tattoo kit, you receive 4 tattoo machine guns (coil guns), power supplies, 7 different 1/2 Oz color inks by Radiant Ink (made in USA! ), LCD power supply, 50 tattoo needles and many different accessories such as tattoo instruction books, DVDs, guides, tattoo stencil paper, gloves and much more. So eventually, if you consider the amount of accessories that comes with, it’s a pretty cheap tattoo kit deal that will allow you to begin practicing the tattooing art and to do all kinds of tattoos you always dreamed about – white tattoos, tribal tattoos, Maori style, different tattoo techniques, shader/liner works and much more. The Grinder tattoo kit got all that’s missing from other tattoo sets around and it’s a great buying decision for a affordable and high quality tattoo kit that can suite advance tattoo artist and a beginner which is looking for a tattoo starter kit as well. Grinder tattoo machine is a great one to start your tattooing career with. Also, it’s suitable for tattoo apprentices or even for a professional tattoo career as well. The tattoo guns are pretty lightweight, around 5oz and got great grip feeling. The quality of the tattoo that coming under this machine is great, very precise and got satisfying feeling while working. When you just get the tattoo gun out of the box, you will need to tune the machine, but once it’s done – it’s great to use (guide for tuning included). We haven’t experienced any issues with them and eventually the Grinder tattoos machine was much more powerful than we expected, especially in comparison to other kits for tattooing out there. 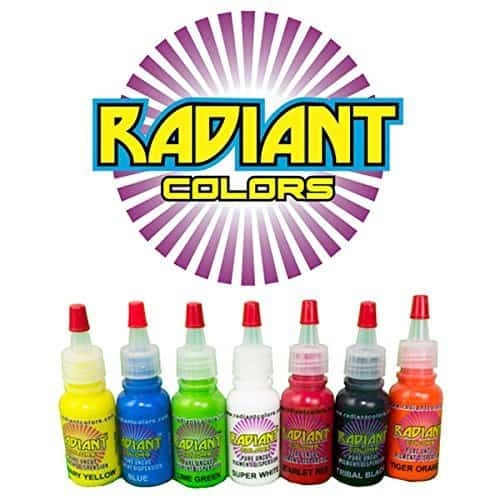 In the tattoo kit you receive 7 different inks (colors + black ink) from Radiant colors. The quality of the tattoos ink are decent as it lays well on the different skin areas. The tone of them is crisp and sharp although not as in the most premium inks (but eventually it’s great for start). Just to mention the colours that included in the ink set: tribal black, super white, canary yellow, lime green, scarlet red, tiger orange, blue (check the image below). It’s a great color and quality variety for a beginner who seek for a cheap tattoo kit and who is starting to build his professional color set. Of course, you can try the premium ones – for premium inks we suggest you to try Kuro Sumi for black ink and one of the Millenium Moms color inks sets for color tattoo inks. Results power supply, doing it’s job just fine and providing the needed power amound for the tattoo machines. The LCD power supply preferred more by us over the analog one because it’s easier to read on the fly. Foot pedal for easier control in included and paired with the supplies. There is a nice clip cord to. Good tattoo kit power supply that provide great value for money. There is BUNCH of them. It’s an amazing tattoos accessories mix especially when you comparing all the cheap tattoo kits out there. There is 50 needles with different sizes, part of them shaders and some are liners, tattoo practice skin, disposable gloves, 240 page tattoo instructional book by Charles Jordan (basic fundamentals of modern tattoo), ink cups and cup holders and much more. Everyone can start tattoos on his own terms and needs. Everything is included. Also, there is little baggies of all the stuff you will need to replace like grommets and rubber bands… basically stuff you’ll need to keep using your kit. In addition, the kit comes with stainless steel tips and disposable tips that match the needles that come in the kit. I personally prefer to use disposable tubes since it requires less cleaning, but the tips are fine to. In conclusion, it’s a great cheap tattoo starter kit that comes with everything that beginners who want to get into tattooing may need. Comes with bunch of tattoo accessories, kit parts is the same as described and the machine work great. Buy it. It’s the best you can get from all the available affordable and cheap tattoo kits out there. Highly recommended tattoo kit for everyone, beginners and advance tattoo artists alike. Great price/quality value.